The Gobi Desert, one of the world’s largest deserts, spans over the territories of China and Mongolia. The name alone ignites the imagination of adventure seekers- towering sand dunes, double-humped camel caravans, and nomads living in far flung arid lands in their traditional gers (yurts). 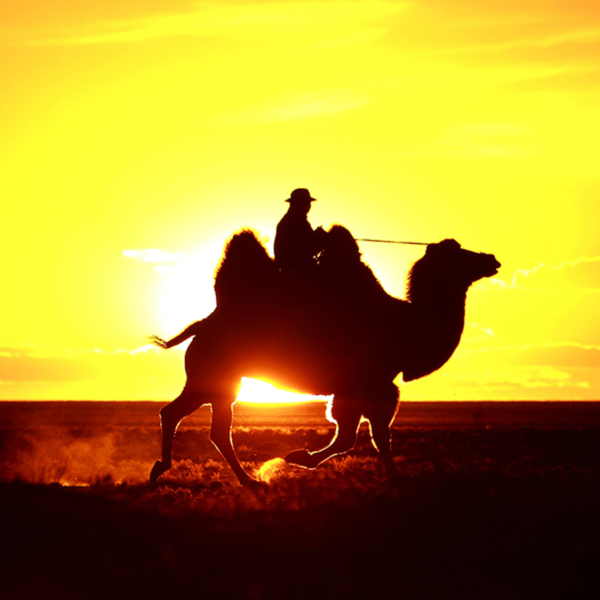 This trip features the best the Gobi Desert has to offer, on both the Mongolian side, and on the Chinese side of the international border that divides the desert. Join us on a once in a lifetime journey across the shifting sands, camel trails, and other secrets this magnificent desert keeps hidden. This morning we take an easy hike to the famous Turtle Rock, a symbol of wisdom and longevity to the Mongolian people. We then continue hiking to Ariabal Temple. The temple has been recently reconstructed, after the original temple had been destroyed during the communist purges of the 1930’s. A site of great tranquility, it functions today as a meditation center to Buddhist monks. After lunch, we leave the park and drive back to Ulaanbaatar’s airport, from which we take an afternoon flight to Baotou. Landing in Baotou, the industrial heart of Inner Mongolia, and by no means a place one would want to stay at, we take the two and a half hours’ drive to Ordos, to which we arrive rather late in the evening, and where we set for the night. Not far out of Ordos we visit the Mausoleum of Ghengis Khan. Despite the fact that the great Mongol leader found his death somewhere on the way back home after yet another successful military campaign in China, most historical facts shows there is no chance his remains are actually buried where the Chinese government has decided to erect an impressive monument to commemorate the forefather of the Mongol nation. Today this somewhat memorial hall, somewhat shrine serves as a center for a cult of Inner-Mongolians which worship here the great Khan as if he is a god. We then make for Alxa Zouqi, a small town with a large Mongolian population, on the edge of the Badain Jaran Desert. On arriving at Alxa Zouqi, we shall go to explore the local Mongolian Buddhist Temple and the street where items made of jade or other semiprecious stones can be bought. Overnight in Alxa Zouqi. Heading towards the desert, on a highway full of trucks carrying exports into Mongolia and returning with loads of Mongolian coal, we reach our lunch stop. We leave our bus here and get into four-wheeled-drive vehicles that will take us to the heart of this remote desert. The Badain Jaran Desert is home to the world’s highest sand dune, rising to some 500 meters, and offers challenging drives as well as marvelous landscapes of sand seas extending to the horizon. We stay the night in the small settlement of Kulat-U beside a small salt lake. Overnight in a simple guesthouse at Kulat-U. In the morning we visit the small Mongolian temple next to the salt lake. We then continue our exploration of the desert, and at about lunch time we reach the area of more than 150 lakes that dot the yellow dunes. We climb to the top of the dunes for a marvelous view over several lakes and stop at Yinderitu Lake, whose waters are believed by the locals to cure a sick person from stomach diseases. Another short drive through the dunes brings us to Soumin Jaran, a beautiful lake with a beautiful Mongolian temple beside it. We visit the temple, now inhabited by only one monk, and stroll along the lake shore. Overnight in a simple guesthouse at Soumin Jaran. We leave Soumin Jaran and drive almost to the top of one of the highest dunes in the area for a spectacular view of the lakes and the seemingly endless seas of sand. From here we take a 2½-hour hike to Nuritu Lake. After a quick lunch there, we ride on two-humped camels to a point from where we can enjoy marvelous views over desert and lakes. We then take to vehicles to drive out of the desert. En route we visit the wall of singing sand and the brave can have a quick bathe in Bor Tulguu Lake. We leave the dunes and stop at the small local museum to learn more about the desert and its surroundings. Back on a solid asphalt road after three days of crossing the dunes, we reach the small settlement of Alxa Youqi. Here we say farewell to the drivers of the four-wheeled-drive vehicles, as we hop back to our vehicle and take the afternoon drive to the city of Zhangye, where we enjoy a much needed shower and comfortable accommodation of a four-star hotel. We drive out of Zhangye and on to Bing Guo. Located at the foot of the Qilian Mountains, this lovely valley consists of marvelous sandstone formations. We take a short hike down the valley and climb up to an observation point for a breathtaking view over this unique landscape. We then continue to Dan Xia, a spectacular mountain with somewhat psychedelic patterns of colors in the rock. If weather permit, we wait for the sun to set over Dan Xia, enhancing the shades and shapes of this bizarre natural phenomena. We then take the one and a half hours’ drive back to Zhangye. This morning we drive to the small airport by Zhangye. From here we take a flight to either Xian or Lanzhou, where we will connect on to the evening flight to Beijing. Arrive in Beijing airport, and transfer to hotel by the airport (using the hotel shuttle services), where we spend our last night of the trip. This morning return to Beijing airport (again, using the hotel shuttle services) for the international flight out of Beijing.